ADJ Lighting is pleased to announce that it’s new flagship LED-powered hybrid moving head fixture, the Vizi CMY300, is now shipping. 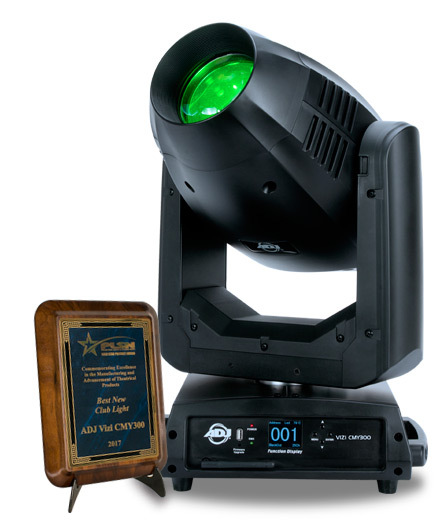 The award-winning unit offers a whole host of professional features, including CMY color mixing, twin GOBO wheels, motorized focus, zoom and iris, wireless DMX and two rotating prisms. Sitting at the top of ADJ’s popular Vizi Series of moving heads, the Vizi CMY300 sets a new standard for what can be achieved from an LED-powered fixture with an attainable price tag. Since its debut at PLASA London back in September, it has garnered interest from lighting designers and installers across the globe and was recently presented with the Best New Club Light title in PLSN magazine’s inaugural Gold Star Awards at LDI 2017. The Vizi CMY300 has a specially-designed 300W LED engine that generates an incredibly powerful beam of light, making it suitable for installation in big venues as well as for large-scale tours and one-off events. As a hybrid fixture, it can function interchangeably as a beam, spot or wash luminaire, allowing designers to achieve maximum effects from one fixture without having to crowd truss in an installation with multiple units. It also allows for less fixtures to be packed in a truck for production events, reducing setup times as well as logistic costs. As its name suggests, the signature feature of the Vizi CMY300 is its full CMY color mixing ability. This gives users the freedom to select from a much wider palette of colors than a regular color wheel. Independent cyan, magenta and yellow color paddles – which allow variable intensities – can be mixed together to create almost any color imaginable. In addition, the fixture still incorporates a standard color wheel which allows easy selection of popular colors including UV. This also features a 3200K CTO filter, which allows the beam color temperature to be altered from the cool white of its LED light-source to a warm white that emulates older lamp-based fixtures. Two separate GOBO wheels allow a huge amount of creative potential when it comes to shaping the fixture’s beam. The first is loaded with eight versatile fixed GOBO patterns + open. This includes a dedicated beam reducer which can be used in Beam Mode to create an extremely narrow razor-sharp beam that is ideal for mid-air sweeping effects. The second wheel features six replaceable rotating GOBO slots + open. Provided pre-loaded with six general-purpose patterns, this wheel allows the use of custom GOBOs with a size of 26.8mm and a viewable diameter of 20mm. To ensure that GOBO patterns appear sharp regardless of the projection distance, the Vizi CMY300 offers motorized focus. It also features a motorized zoom function which allows the beam angle to be altered between 8- and 46-degrees, allowing for tight beam effects as well as wider GOBO projections. In addition, the fixture offers an in-built Frost filter which switches the beam from a hard-edged spot to a soft-edged wash. Finally, the fixture is also equipped with a motorized iris which can be used to reduce the beam intensity to anywhere between 100% and 5%. Offering even more creative potential, the Vizi CMY300 also features two separate multi-faceted rotating prisms. Both the 3-facet circular and 6-facet linear prisms can be used independently, but can also be layered together to create unique and complex projections. These are ideal for adding interest to a stage set or the walls/ceiling of a venue as well as for creating impressive mid-air beam effects. With variable speed as well as fine pan and tilt control, the head is capable of both smooth slow sweeps and fast precise movements. It has a pan range of 540-degrees and a tilt range of 270-degrees, making it capable of covering a wide area wherever it is positioned on a stage or within a venue. A professional-caliber fixture, the Vizi CMY300 boasts a modular design which allows for straight-forward servicing and on-the-road repairs. Easy access to the inside of the head also makes for simple and quick GOBO replacements, while a built-in USB socket means that future firmware updates will be extremely easy to apply. This is facilitated by a large backlit full color display screen which also makes mode selection and DMX addressing very simple. Both 3-pin and 5-pin DMX sockets are provided and the fixture offers a choice of three control modes using 21, 24 or 26 channels. It is also fitted with a built-in antenna for ADJ's WiFLY EXR wireless DMX system that transmits a signal up to 2,500 feet / 700M (line of sight). This means that the Vizi CMY300 will easily integrate into any existing lighting setup, either cabled or wireless, and can also be used to setup a new WiFLY system. The Vizi CMY300 supports an input voltage of 100-240V at 50/60Hz, which means that it is suitable for international use and therefore worldwide touring duties. It is also fitted with locking Seatronic powerCON input and output sockets, which allow the power for up to 4 fixtures (at 120V) and 8 fixtures (at 230V) to be daisy-chained together from a single mains socket. With measurements of 14.75” x 12.75” x 24.5” / 370 x 325 x 619mm, the Vizi CMY300 has a smaller footprint than most other moving heads in its class. At 51 lbs. / 23 kg. it is also relatively lightweight, making it easy to carry and rig. For touring and event productions applications, ADJ’s DRC16RX road case is perfectly sized to protect, store and transport a pair of the fixtures along with accessories such as clamps, safety cables and power cords. Combining a potent 300W LED light-source with an extensive collection of motorized beam-shaping tools, including full CMY color mixing, the ADJ Vizi CMY300 is ideal for a wide variety of applications including concert tours, theatre productions, festival stages and large church installations. Despite offering an expansive feature set and excellent build quality, it has a more compact footprint and lower price tag than other fixtures in its class, making it the ultimate LED-powered hybrid moving head.